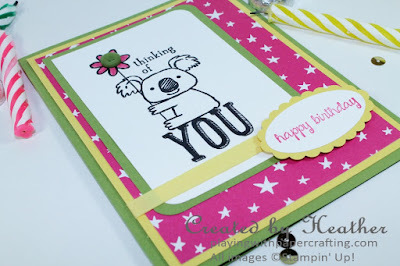 I have my first Stamper's Dozen class today and it's a Birthday Stamper's Dozen. I needed a range of designs that would suit all ages and genders. In this batch, I have cute, classic and masculine and wanted one that would work for kids, but not overtly, as some of my customers don't have young children. I dug out a stamp set that I haven't used for a while, but it's perfect for this task. A child would love the image, but it would be suitable for an adult as well. 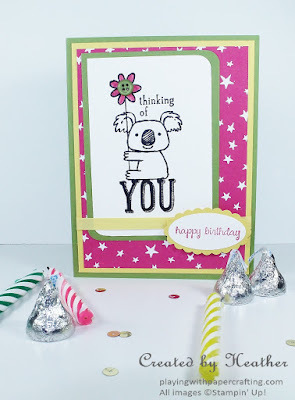 It's called Kind Koala. 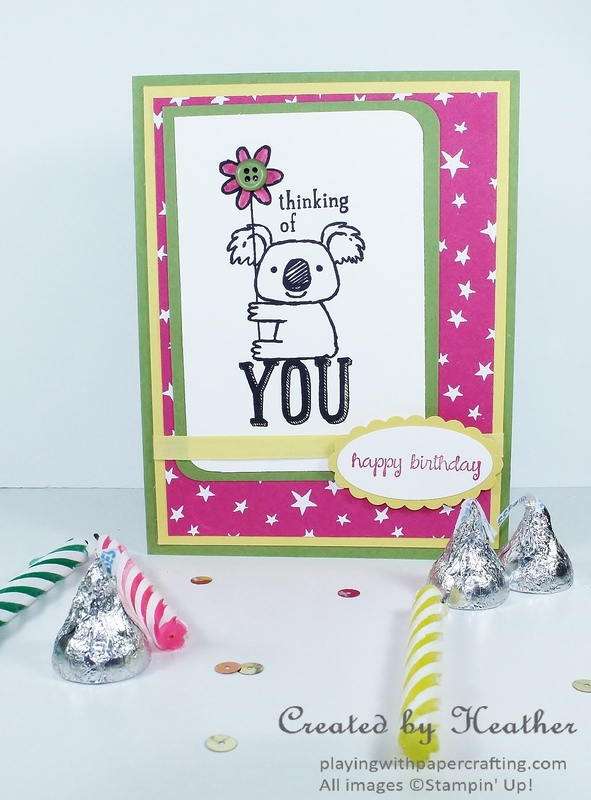 Bright colours keep the card youthful, so I chose Old Olive, Daffodil Delight and Melon Mambo as my palette. The image itself was stamped in Basic Black Archival Ink because I didn't know if I was going to colour in the image or not. 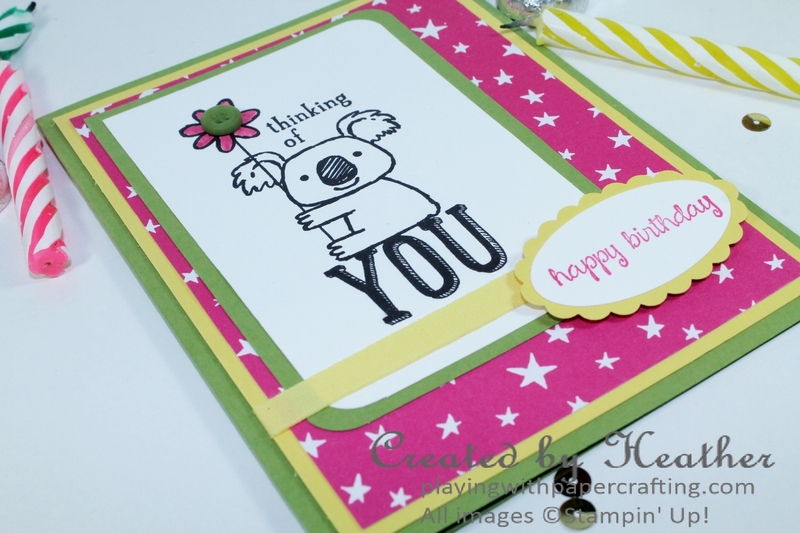 In the end, I only coloured in the flower to keep it quick and easy enough for a class in which the participants make 12 cards altogether. 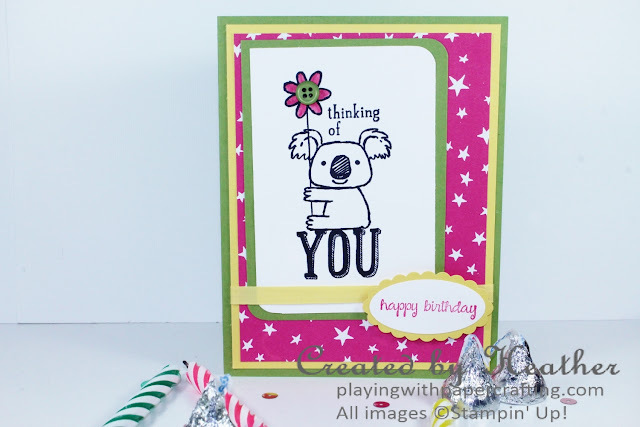 The sentiment is from And Many More Stamp set. It is a more up-to-date version of Teeny Tiny Wishes. I needed it to be small enough to fit in the Large Oval Punch, which coordinates with the Scallop Oval Punch for a cheery looking greeting. The background paper is from the It's My Party Designer Series Paper Stack. I love this 12" x 12" paper stack because it has 4 pages of each design, which gives me plenty of paper for classes. It's a little more expensive because of it's size, but well worth it, in my humble opinion. Some Daffodil Delight Cotton Ribbon finishes off the design.